Primary Prevention Implantable Cardiac Defibrillator Trials: What Have We Learned? This issue of Cardiac Electrophysiology Clinics, edited by Drs. Mohammad Shenasa, N. A. Mark Estes III, and Gordon F. Tomaselli, will cover Contemporary Challenges in Sudden Cardiac Death. 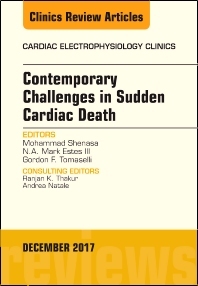 Topics covered in this issue include Pathophysiology; Basic electrophysiological mechanism; Channelopathy and Myopathy as causes of sudden cardiac death; Public access to defibrillation; Sudden cardiac death in children adolescence; Sudden cardiac death in specific cardiomyopathies; Ventricular arrhythmias and sudden cardiac death; lessons learned from cardiac implantable rhythm devices; future directions, and more.